To ensure trouble-free operation of water-tube boilers the feed water must be of high quality with a minimal solid content and an absence of dissolved gases. Solids are deposited on the inside surfaces of steam generating tubes, as the water boils off, and the scale so formed causes overheating and failure. Dissolved gases tend to promote corrosion. Distilled water used as boiler feed has a great affinity for gases in the atmosphere. Chemical treatment is aimed at preventing corrosion problems but the boiler closed feed system must play its part in maintaining minimal contact between feed water and air at every stage and in promoting the dissociation and removal of any air or other gases. The feed system also assists efficient operation by condensing used steam and returning it to the boiler as feed at the highest temperature attainable economically. In practical terms, this means maximum recovery of the latent heat in steam. Regenerative condensers and de-aerators are two major components in the complex feed systems which have been evolved. 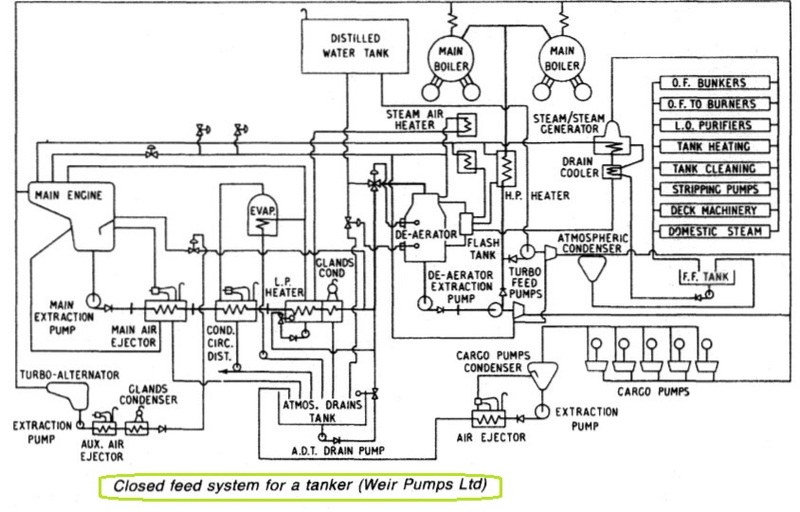 The feed system for a tanker (Figure 1) shows a superheated steam supply from two water-tube boilers to the main propulsion turbine, the turbo-alternator and for cargo pumps. Each of these is served by a separate condenser and extraction pumps which return condensate to the closed feed system. Non-condensable gases and some vapour are removed from the main condenser (Figure 1) by an air ejector, cooled by the main condensate and released in the ejector condenser. The condensed ejector steam passes with other clean drains (gland stearn condenser, low pressure feed heater, evaporator) to a drains tank from which a pump draws, to discharge, with the mains condensate, to the de-aerator. It is common practice to reflux these drains, that is to return them to the main condenser in the form of a spray at a high level where, meeting the turbine exhaust, they are de-aerated before mixing with the main body of the condensate and being removed by the condensate extraction pump. Heating steam for the steam/steam generator, the de-aerator and the low pressure feed heater are bled from the main turbines at appropriate stages, so that all of the latent heat Is recovered. The feed pump exhaust is treated similarly. The steam/steam generator, providing low pressure steam for services whose condensate may be contaminated, has its own separate feed system. The centrifugal extraction pump, driven either by electric motor or steam turbine, draws from the condenser and delivers to a de-aerating heater through the heat exchangers already mentioned. Another extraction pump passes the de-aerated feed to a multi-stage centrifugal pump, also either electric motor or, more often, turbine driven. The pump delivers the feed to the boilers at a temperature approaching that of saturation through a high pressure feed heater, supplied with steam bled from the high pressure turbine. Make-up feed is produced by evaporation and distillation (sometimes double) at subatmospheric pressure, stored in a tank and introduced to the boilers from the main condenser with the refluxed drains or through the de-aerator. The feed pumps, feed piping and fittings are duplicated.